Let it Pass: Never argue with a negative person. Approaching them during a negative thought process or arguing will only intensify their negative beliefs, causing the situation to become worse, pushing you into a negative frame of mind as well. Stay silent and wait for the negativity and anger to pass. Offer Love: While it may be tough to offer love and attention to a negative person, it is often the best way to get them off the negativity track. No individual is inherently mean, cynical, or critical. Negative people are usually the most injured because he/she is constantly feeling unloved. In such a situation, the best approach would be to try and find out the reason behind their troubled mood and acknowledge it even if you can’t relate to it. Try offering a hug or a comforting pat. Negative people identify this as a sign of you showing interest in their problems. This will help to ease the situation a bit. Focus on the Positives: The trouble with negative people is that they are constantly drowning in their own misery so much so that their negativity eventually becomes a sort of habit. 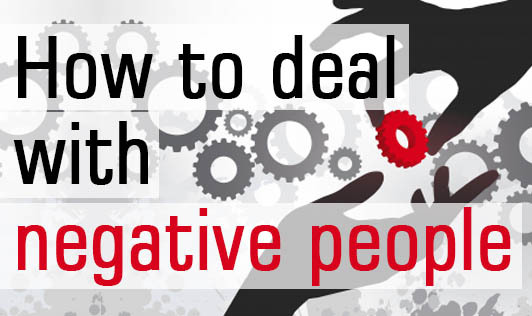 When you come across a negative friend or family member, steer them to the positives. Talk about their other significant achievements. They may not be able to see the light at the end of the tunnel right away, but during some break time, they will ponder over what you have told them. Convert Generic to Specific: Negative individuals tend to place everything in a bad light. They also tend to generalize their opinion or rather frame their opinions over one specific negative experience they have had in the past. During such times, try and streamline the conversation and make it more specific. For instance if they say- “You can’t trust doctors”, ask them “Which kind of doctors can’t you trust?” This specific question will make them reanalyze and reevaluate their negative statement. Detach and Avoid Changing Negativity: It is extremely difficult to change a negative person’s point of view. Therefore, the wisest thing you can do is to temporarily detach yourself to prevent the negativity from getting to you. Stay Away: You don’t need people to constantly pull you down on a day-to-day basis. Some people are so negative that it always proves good to remove them from your life. This is easier said than done. While it can be possible with friends, one cannot necessarily do the same with a family member. This is when professional counseling may help. Run a Check on Negative Thoughts: Keep a check on the thoughts (positive and negative) coursing through your mind. Negative thoughts can bog you down and influence your behavior as well. Interact with positive people that help bring out the best in you. Reflect on all the positive things in your life at the beginning of each day and before going to bed at night. Express your thankfulness for all the positivity in your life and engage in activities that make you happy. The world can be good or bad, depending on how you decide to view it. Positivity is as contagious as negativity is. So by being positive and hopeful, you are not only helping yourself, but also the people around you.